So it’s looking like it’s “dead for now” — though Amazon could always have a secret plan for reviving the Kindle Touch sometime in the future. But currently Amazon is also no longer showing the Kindle Touch among the strip of all available Kindle models that’s displayed at the top of each Kindle’s web page. And Amazon’s U.S. web page for the Kindle Touch is now simply pointing shoppers to their new touchscreen Kindle Paperwhite devices (officially released just three weeks ago), which Amazon describes as a “newer model of this item.” Unfortunately, the new Paperwhite, with its built-in front lighting, is significantly different from the Kindle Touch, and it’s drawn at least a couple of dissatisfied reviews. 676 users have now given the new Paperwhite an average rating of less than 3 and a half stars on Amazon (out of a possible five), which is lower than any previous model of Amazon’s black-and-white Kindles. But to head off any disappointment, Amazon’s now taken the unusual step of “preemptively disclosing” shortcomings of the Kindle Paperwhite right on its web page, “most likely to get out in front of user complaints,” C|Net reports. Towards the top of the Paperwhite web page, Amazon’s now linking to a web page from “the Kindle Team” which presents three disclaimers. (“Learn more about certain design decisions and changes from prior generations to help make an informed purchase,” the link promises.) 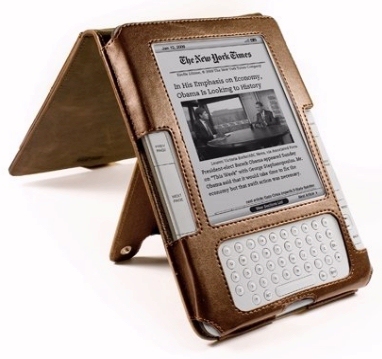 On the page, Amazon acknowledges that at the bottom of the screen, the Paperwhite’s built-in light will sometimes provide uneven illumination under certain lighting conditions, and that, unlike the Kindle Touch, it doesn’t have audio or text-to-speech capabilities. And there’s also only 2 gigabytes of on-device storage, half of the storage that was available on the Kindle Touch. Amazon may be suffering a backlash after high interest in the device, which they’re apparently trying to address before “Black Friday” and the big holiday shopping season. One day after its official release, Amazon had already sold out of their Kindle Paperwhite, with an Amazon executive conceding that pre-orders “have far exceeded our expectations.” But even three weeks later, new orders are still being delayed 4-6 weeks, with Amazon also imposing a new limit on orders of two per customers. Of course, that information also makes more sense now that we have the other piece of the puzzle. If the Kindle Touch really is unavailable now, that could explain the higher-than-expected demand for the new touchscreen Kindle Paperwhite! But it’s also got me wondering if Amazon might bring back their older Kindle Touch devices — especially if they’re having trouble filling orders for the Kindle Paperwhite during the crucial Christmas shopping season. I wouldn’t be absolutely surprised if Amazon suddenly announced they were bringing back the Kindle Touch for a special a sale on Black Friday. Amazon wants customers to be happy, so it’d make perfect sense to give Kindle them a choice for their touchscreen Kindles. After all, Amazon’s real goal is to just to sell you a Kindle. They don’t necessarily care which one!